Kids everywhere have either returned to school or are going to start soon. Weeks before we begin making preparations. From buying school supplies to picking out clothes. The night before we start packing lunches and make sure everything is ready to go. I prepared, I bought the supplies, I picked out the clothes, I packed their lunches but there is something I forgot to do the morning before I took them to school. With the rush of taking pictures and getting the kids to school on time I did not pray. I didn't even realize it until this morning (the second day of school). Although I prayed for them the night before, I didn't pray with them. There is a difference. Why does it matter you ask? We've all seen crazy things happening in schools recently, from shootings to sexual assaults. It is scary stuff! You would think by taking them to school they would be safe but we live in a messed up world. A world so torn by sin that you can see the consequences everywhere you go. So why would schools be any different? Instead of being paranoid and keeping my kids home all day everyday I choose to trust, trust in God. I may not be with them but God is. It is important that I not only pray for them but that I pray with them. I want to teach them to learn to love God and trust in Him and by having them pray with me they can begin to form that love and trust. 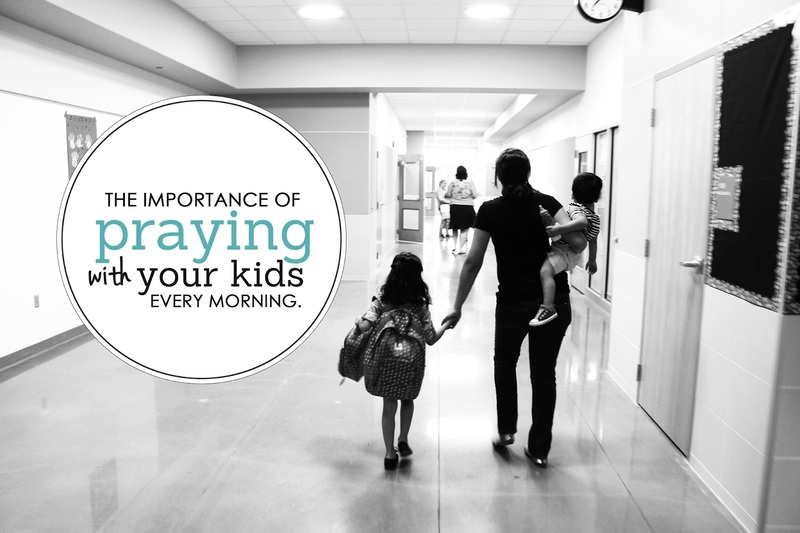 Growing up my mom would pray with us each morning before school started. It kind of became a routine for me and although sometimes I wasn't in "the mood" to pray, there my mom would pray and I would just sit and listen. A seed was planted. I can see now how God protected my sisters and I from many things. A couple years ago I learned that the bus driver that drove my sister and I to high school had molested a young girl for four years. I was shocked! This man seemed like such a nice man, my mom would give him bagels and such. I couldn't believe it and although I felt extremely sad for the girl it made me realize something. This man who was capable of molesting kids drove me to and from school for four years and never laid a hand on me. I know now that God protected me. Would my mom had known this man was capable of such things she would have never let me ride the bus but her trust was not in that man, not even in the men and women who taught me. Her trust was in God. The seed she planted is growing. It drives me to pray with my kids every morning knowing full well my trust lies in Him and Him only. You see you may not be with your kiddos 24/7 but there is someone who is. God watches over our children but we must pray. We must pray for their teachers, for their classmates, for their school but most importantly we must pray with them. Pray with our kids so that they may learn to love God. So that they may learn to trust in Him. Let us plant a seed.